In a word, this book is lovely. 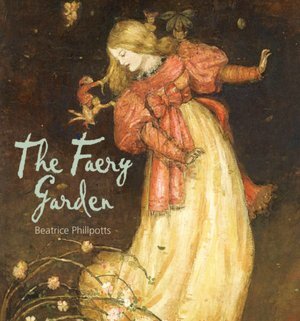 Combining jovial and intriguing snippets from faerie lore and literature with breathtaking illustrations, Beatrice Phillpotts invites us to divulge in the long, magickal, and herb-seeped history of the faerie garden and its inhabitants. The book is tidily trimmed into three modest chapters. In the first, Phillpotts treats us to a plethora of information and stories about faeries and their gardens, drawing upon resources in literature, poetry, legend, and historical tradition. Phillpotts supplies passages from Shakespeare’s A Midsummer Night’s Dream, Christina Rossetti’s “Goblin Market,” Robert Herrick’s “Oberon’s Feast,” Hans Christian Andersen’s “The Little Elder Tree Mother,” and W.B. Yeat’s “The Stolen Child,” as well as her own rewrites of other faerie legends, to make this chapter a diverse and enchanting introduction to faerie gardens. In the second chapter, Phillpotts has us meet a delightful array of flower faeries for each season of our gardens. Featuring varied subjects such as honeysuckle faeries, fern faeries, and mistletoe faeries, each fey garden sprite is accompanied by illustrations, lore, and mentions in literature, making this second chapter an ideal reference book for those interested in faeries, gardening, or anything in between! The third and final chapter finishes the book nicely, with instructions and guidance as to how we might grow our own faerie gardens — and even a faerie tree grove! Here Phillpotts pulls passages from Scott Cunningham, Geoffrey Chaucer, and Shakespeare, quoting magickal potions, time-tested herb mixtures, and evocative garden layouts, to help us decide what sort of garden we wish to plant — one for protection? Love? General-all-around faerie-ness? All the necessary herbs for such gardens are printed neatly and plainly in a titled list, so we can quickly determine which garden is right for us and which herbs we will need to get started. For example, the kind of garden I’d like to plant is a Love Spells Plot, a garden that will conjure love and happiness in my life. Phillpotts outlines the herbs I will need to plant to achieve this: orpine, rose, pansy, parsley, sage, rosemary, and thyme. Accompanying the list, Phillpotts includes love garden lore, lore about the herbs included, mentions of the herbs in ancient/mediaeval literature, and suggested arrangements for the garden plot. (I will certainly be planting this come warm weather!) Phillpotts also demonstrates how to consecrate your magickal faerie garden and includes tips on how to sync your garden with the Zodiac, excellent for beginning garden witches, master gardeners, and faeries alike. Even if you aren’t a gardener, this book is also worth reading for the illustrations alone. Alongside the tactful passages are dazzlingly delightful pictures, all of which depict faeries, ethereal mist-shrouded hills, and wise old trees. Some are sketches; others are oil paintings; and others are breathtaking watercolours, and each will inspire a vivid fantastical story in and of itself. My personal favourites are a drawing of a beautiful faerie queen trying on jewellery attended by her maids; a painting of many bejewelled faeries dining in rich red, gold, and yellow splendour; and another painting of a mediaeval maid in luscious green standing amid flower faeries in a sacred meadow. I would highly recommend this book to everyone. If you are an herbalist, a witch, a gardener, or even just love faeries, you need this book on your shelf.